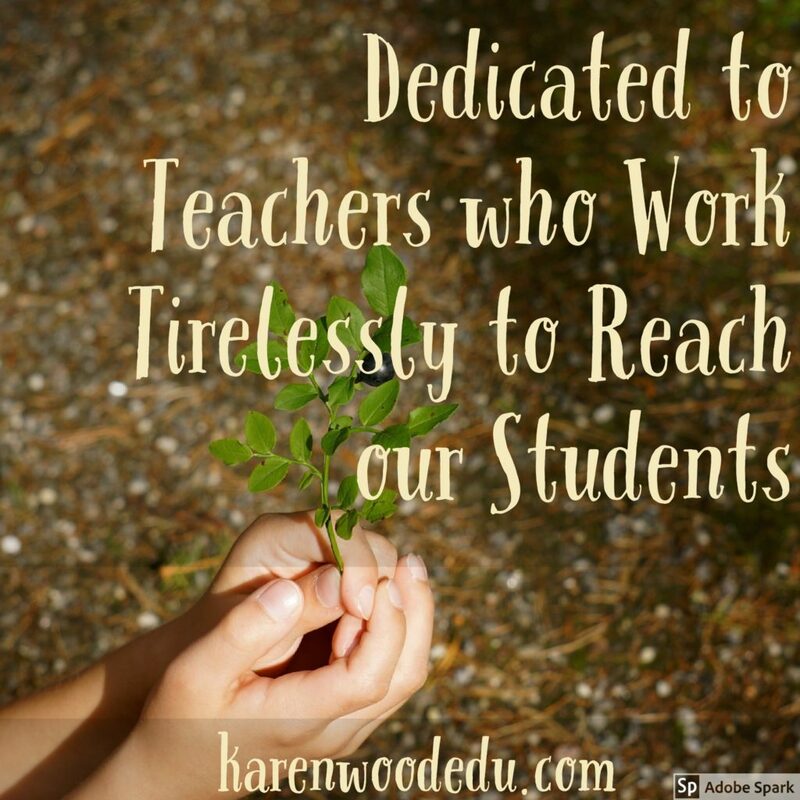 This post is dedicated to teachers everywhere who work tirelessly to reach our students everyday. I am from New Jersey. If you are from New Jersey, you know that we have a new Governor. For me, the jury is out on what will happen in our state on all fronts. But this post is not about politics. It’s about teaching. I was inspired to write because I love teaching, education, and watching students grow and learn everyday. Education is my passion. But in my opinion, our previous Governor hurt the teaching profession. In 2015 he said that teachers unions are “the single most destructive force in education.” In 2016, he said that teachers unions were “New Jerseys version of the Corleones”. In 2017, he said ““All too often this system is built for the comfort of adults: how much money they want to make, what kind of benefits they want to work, or don’t work.” Although I know these comments were pointed at unions, they vilified teachers and damaged the profession that I love so much. Teachers must get their bodies on the schedule they have been assigned. They are unable to use the bathroom or take a break, other than when it is scheduled into their day. Teachers spend an inordinate amount of time preparing their lessons. This means they don’t only work from “8 to 3”. This means they spend time researching, reviewing, prepping and revising BEFORE they even meet with their students. Teachers must engage every child. What if each time someone walked into your store and didn’t purchase something, it counted against you? Engagement of every student, every day is easier than it sounds. Hopefully by the end of this post, you’ll realize why. Teachers spend lots of time learning to get better. This is a cause of frustration for some on the fiscal end but it is essential. Imagine if Fortune 500 companies or big businesses and industries decided it was “too costly” to invest in their brand, invest in their customer service, invest in the skills of their employees? That concept has little merit outside of education. Yet in the education sector, professional development funding is often scrutinized. Teachers spend time outside of class focussed on student growth. They grade papers. They analyze student responses and individualize assessments so that every student can learn and so that proper differentiation is provided. They learn new strategies and implement them, tweaking and revising along the way, until they have managed to hold the attention of a challenging class and get to the content of the standards they are responsible for. They go to cross country meets and football games and concerts to support students who need it. They know that if a student sees a teacher OUTSIDE the classroom, that students will work harder. Reaching a child in the classroom sometimes means doing things outside the class to support their students. ….and the list goes on and on…. Teaching can be like performing for an unwilling audience. Have you ever had one of those days where you didn’t feel like engaging with your colleagues or making extra calls to boost sales? Maybe you didn’t feel up to showing just one more home to a prospective buyer. Imagine having twenty-five or so students who didn’t quite feel like learning. They smile A LOT! Smiling matters! Think about it. When someone smiles at you, the natural tendency is to smile back. Try it. Smile at a total stranger. Do they smile back or turn away? Go a step further. Smile and say, “How are you?” or “Have a great day.” Teachers go a step further. They smile and they say, “I’m so happy you are here today!” and they mean it! They praise their students and find joy in every minor victory or improvement. This can mean a small comment on the side to a shy student or an absolute focus on a success complete with music, certificates, and a call home. Let’s face it, the best praise is the one that is shared. They go the extra mile to reach a student, staying up late, attending free professional development or registering for workshops on their own to implement new strategies. They try over and over again to reach a student. My son is not a reader. He is a good student. He loves school. He is very social and I think he is liked by his peers. For years, I have been trying to get him to read. He came home Wednesday and said, “Mom, can you get me this book?” I nearly fell off my chair. I was overjoyed! As an avid reader, I was DYING for my son to discover the joy of a good book. Then, “They’re having a book fair at school and I really want to buy a few books. Can I have some money?” Of course, I thought! Thursday night, after the book fair, Friday morning before school began, and yesterday, I saw my son reading quietly. He chose the comfort of an exciting story with characters he could relate to over YouTube or chatting with his friends. His teacher DID NOT stop until she inspired my son to read. I will forever be grateful for her dedication in going the extra mile. They are creative. They comb Pinterest or pester colleagues to find ways to excite their students. They CELEBRATE! They get on Twitter or Facebook or Instagram or use Remind to share their amazing successes with families in their community. The call home to share successes with parents. They tell the school Principal so that he/she can make an announcement, provide a sticker, or a free treat. They are proud of the profession they chose no matter what anyone says. They inspire others to become teachers, to recognize teaching and learning in any form. They inspire their students and they wouldn’t have it any other way. They are grateful for the ability to work in the most amazing profession. The one where we get to influence the future and support the learning needs of the next generation! Don’t forget to thank a teacher. I know I will. Yes! I found myself nodding and giving you a mental “Amen!” as I read this. Teachers are amazing. Thank you taking the time to celebrate the magic that happens in education. It truly is magic. Thanks for reading and responding! Totally agreed… but unfortunately in life, it only takes a few that made our old governor give teachers a bad rap. I know my friends who are teachers give a 110%, they are amazing people. So far my experience that I’ve had with my own teachers from my own education have been wonderful people as well. Furthermotr, I am blessed for my children have the most magnificent teachers as well. Teachers get a bad rap, but most teachers are truly incredible people. I could never do that job…go teachers!! Agreed! Thanks for reading and responding. Previous PostPrevious Practice Football or Practice Joy? Why not Both?